Did you know that your email signature is the easiest, cheapest marketing tool in your toolbox? Think of your email signature as your digital business card. You “hand it out” every time you contact someone. No printing costs. No awkwardness. (“Can I, uh… um, give you my card?”) Send an email and BAM. Digital business card, right in their inbox. Have you ever noticed how when you share a story with someone, it becomes their story too? There is something validating when we can say, “Oh yeah, that happened to…” me, my friend, my brother, my dog, whomever… It’s a concrete way of showing that we can relate to what the other person is saying. And it can be really exciting to be the first person to share a story within your circle. This idea was highlighted for me tonight. My wallet was stolen this afternoon. That’s a pretty simple statement, but the narrative of the events unfolding and the aftermath of it all is quite complicated. The story isn’t even complete yet. I have shared it with my immediate family, and then (somewhat without thinking) I posted it on Facebook. As I lay awake in bed, unable to sleep, I realized that I am already tired of the story and regretted the Facebook post. I don’t know that I want to keep hashing it out with every person I know, because it’s tiring to keep reliving the experience. But, I know that the story will spread throughout my network, even though I don’t know that I necessarily want it to. Have you ever heard anyone say something like that about Facebook or Twitter? I know a sizable group of people who cannot understand the “me, me, me” aspect of social media. They don’t want to jump on Twitter or Facebook, because they don’t feel they have anything to say that would matter to their audience of friends and acquaintances. They recognize that it can be really rude and self-absorbed to do nothing but talk about yourself, when your audience isn’t interested in hearing about your latest snack or TV obsession or how much you drank last night. But, many people make the same sort of mistakes on the homepage of their business website. “We’ve worked with these great companies! We are awesome! Buy from us!” We, we, we! You at least know the people on Facebook that you’re bragging to, but on a homepage, you’re bragging to total strangers. Think about what’s important to you when you visit a new site. You are trying to decide (quickly) if this company offers what you’re looking to buy. Do they look trustworthy? Can you quickly find what you’re looking for? If they past the initial sniff test, do you know where you should go next? What you think is the most important thing to tell your customers on your homepage may not be the same information that they think is most important. Try to imagine your ideal customer, and think about what they want to know. If you can design your web presence around the needs of your ideal customer, you will be far more successful than designing it around your own needs and personal preferences. How many magnets are on your refrigerator right now? Did you buy them yourself, or are they from businesses? I’d bet at least half are from businesses. My parents have magnets on their fridge that have been there for at least 10 years. I’d recommend considering a refrigerator magnet for your next promotional item giveaway. I personally love the ones with the little clip to hold papers. They’re so sturdy. Thanks to Lee Silber and his book, Self-Promotion for the Creative Person: Get the Word Out About Who You Are and What You Do for this fun fact. Full disclosure: Links to the books in the post above are Amazon affiliate links. This means if you click on them and buy something, I receive an affiliate commission. I hope you do, because it helps me buy new books. And then, I can share all that wonderful new information with you. More on this disclosure stuff at publisher Michael Hyatt’s excellent blog. Thanks to the Communicatrix, Colleen Wainwright, for inspiring this disclosure (among other things). This week, I tried something new. Each day, I wrote a post about a topic that I’ve been studying: search engine optimization (or SEO, for short). In case you missed them, here’s Monday, Tuesday, Wednesday, and Thursday‘s posts. Honestly, I wasn’t sure what to write about today. So, I did a quick Google search for “top SEO tips” as a starting point. It felt like cheating, but at the same time, shouldn’t the best advice on Search Engine Optimization be at the top of the search? From the title, SEO in a Day, I was really skeptical. In my experience, articles/books with “___ in a Day” are usually really watered down, empty content. I was pleasantly surprised. I learned about how to optimize this blog (which is powered by WordPress) by installing a few more plugins and tweaking the settings. I also found his explanation of keywords and keyword tracking to be really helpful. I’d say it’s worth it to download and review the 36 pages. One other gem I found on the site was this idea of making it incredibly easy to link to your work, and with the link text YOU want. Check out Top 10 SEO Tips. At the top of the page, he wrote the HTML code he’d like people to use when linking to his site. Honestly, it made it easier for me to create the link, and he will benefit more from the link because the link text includes keywords that he is targeting. He didn’t leave it up to me, he did the work for me. Consider adding something like this on your own site. I don’t necessarily agree with his comments that you should fire your Webmaster, developer and SEO expert and strictly DIY. I think it’s important to have basic knowledge of whatever you’re hiring a professional to do (so you can speak intelligently about what you’re looking for and make sure you’re not being taken advantage of) but a professional can almost always do it better and faster than you can. Then you should check out, 55 Quick SEO Tips Even Your Mother Would Love. Use keywords in the image ALT attributes. If you don’t update your content often, you should have blog and update it at least 3 times per week. When optimizing blog posts, you should optimize your post title tag independently from your blog title. Use keyword-rich captions with your images. When I relaunched my site in December 2009, I thought I had a good handle on the basics of SEO, but after this week of researching and writing on the topic, I have plenty of SEO-related updates and maintenance to do. I hope you found this series helpful. Did you like the increased amount of posts this week? Do you like the idea of a weekly topic, or were you bored by the end? Comment on this article or send me an email at danielle [at] daniellebaird [dot] net with your thoughts or with ideas on another series. Thanks for reading! This week, I’m trying something new. Each day, I’ll write about a topic that I’ve been studying. This week’s topic: search engine optimization (or SEO, for short). Check back each day for a new post, or why not just subscribe to the RSS feed? Many of the factors relating to page rank rely on the talent of your web developer, web designer and/or copy writer. Hiring these professionals requires a budget — but there are things you can do on your own, for free, to help your site’s page rank. On Tuesday, I shared some tips and resources about how to improve your rank, which included the importance of inbound links. You can ask other sites to link to you, ideally with keyword specific text as the hyperlink, but you really don’t have any control over whether or not that site will actually link to you or how they’ll do it. So, how do you get inbound links? You can create (some of) them yourself. Create business profiles on sites like LinkedIn, Biznik, Facebook, Twitter, Yelp, etc. and fill out the profile information. Include a link to your business. Publish articles anywhere and everywhere you can. A site like Biznik is a great place to get published. Demonstrate your expertise by writing a helpful article, with an extended byline linking back to your website. Create an HTML signature to use in Web-based discussion forums that uses your name (or business name) as a link to your web site. Every message you post becomes a link to your site that search engines can index. These tips alone aren’t guaranteed to move you to the top of a search — but they are especially great for increasing the page rank for your name or business name. These won’t necessarily help your page rank, but it will help drive visitors to your site, which will hopefully result in conversions (see Monday’s post). Include links in your email signature. Don’t forget your signature from your Blackberry /iPhone/Smartphone. You send out 300 emails a day? That’s 300 opportunities to share a link. Comment on other people’s blogs. People feel like they need to have a blog or “a Twitter” because “everyone has one.” I have a journalism background and I like to write — but I’ll be the first to say that maintaining a blog is challenging and time consuming. Reap some of the same benefits, with less effort. Read blogs that your prospects read and leave comments. Most comment forms ask you to fill in your web address, which becomes a link back to your site when you comment. In tomorrow’s post, I’ll share some additional SEO resources. Don’t miss it: subscribe to the RSS feed. A collection of over 20 SEO tools designed to help with a variety of search engine optimization. It groups the tools into different categories, such as Page & Site Analysis Tools, Competitive Analysis Tools, Keyword Research & Discovery Tools, etc. I learned that when searching for “danielle baird” my site ranked #1 on all, except for Bing, where it was #3. I was curious, so I did a Bing search, and sure enough, my old, old, OLD portfolio site (which I thought DePaul had taken down and I no longer have admin access to) and someone else’s MySpace account appeared above www.daniellebaird.net. All of the SEO research I’ve done doesn’t mesh with the way Bing is operating…I don’t consider it a credible search engine anyway. Among other things, the Google Toolbar includes the PageRank of the site you are currently browsing. The PageRank isn’t an obvious part of the toolbar – it’s located between the Bookmarks and Translate buttons. If you hover your mouse over the bar, a tool tip appears “PageRank is Google’s view of the importance of this page (X/10)” with X as the numeric value assigned to that page. In tomorrow’s post, I’ll share some ideas on how to build up your page rank, without the help of a web designer or developer. Don’t miss it: subscribe to the RSS feed. SEO week: #2 – Where do you rank? Page ranking is complicated. It can vary from search engine to search engine. It can vary from day to day. Page rank is directly related to keywords. As I mentioned in yesterday’s post, saying that you want to “show up on Google” means nothing. You want your site to appear in the search results when someone types a query into the search box. The words they type in the search box are keywords or keyword phrases. When someone types in a keyword phrase, the search engine looks through its database of indexed pages and returns the best matches for those keywords. How do search engines determine the best match? This is where things get a little more complicated. This article explains, in detail, the algorithm behind Google’s patented PageRank and the various factors that impact it. Some takeaways: More internal linking (links within your site) and increasing the number of pages of your site helps your rank. However, don’t create duplicate “cookie cutter” pages just for the sake of a higher rank – it’ll actually count against you. Inbound links (links from other websites to yours) increase your ranking, because another site is essentially “voting” for your site. Outbound links add credit to your site’s existence, but too many outbound links actually drains your PageRank. seomoz.org has compiled a phenomenal amount of information from world renown SEO experts. Their top-five ranking factors: Keyword Focused Anchor Text from External Links, External Link Popularity, Diversity of Link Sources, Keyword Use Anywhere in the Title Tag, and Trustworthiness of the Domain Based on Link Distance from Trusted Domains. Some of the Ranking Factors can get really overwhelming and jargon-heavy, but scroll down to the comments section to read what some of the experts have to say (in plain English). In tomorrow’s post, I’ll share some tools on how to discover what your PageRank is and how to know where your site appears in different search engines based on your keywords. Don’t miss it: subscribe to the RSS feed. SEO week: #1 – What is SEO? The following outlines the basic benefits of SEO: indexed pages, rankings, visitors and (ultimately) conversions. The goal of the entire SEO process is to get people to do something. Robots or crawlers from search engines move through all the content on the web and index it, which allows it to appear in a search. It is important to make sure that search engines can find your pages and decipher them – this is something that needs to be done by a web designer or developer. See the extra credit reading at the bottom for more information on constructing an optimized web page. So, at this point, search engine robots have indexed your pages, and your site appeared when someone searched for something. Now, a real human clicks and views your site. We’re getting there! Unless you receive payment on a cost per impression basis (like via ads) this still doesn’t mean much. This is the ultimate goal of SEO. Those real, live people visiting your site do something. A conversion can be anything you want – a purchase, a download, a comment, a phone call, an email, a follow on Twitter, a subscription to an RSS feed, etc. It’s important to know what you want your conversions to be so you can set your optimization goals accordingly. These are the bare-bone basics of what SEO is: Create a well-structured web page with great content and keywords so that the search engines can index it. Your site ranks well for keywords that you’ve chosen. Real people visit your site. Those people do something based on the information they find on your site. In tomorrow’s post, I’ll talk more about what determines search ranking. Don’t miss it: subscribe to the RSS feed. 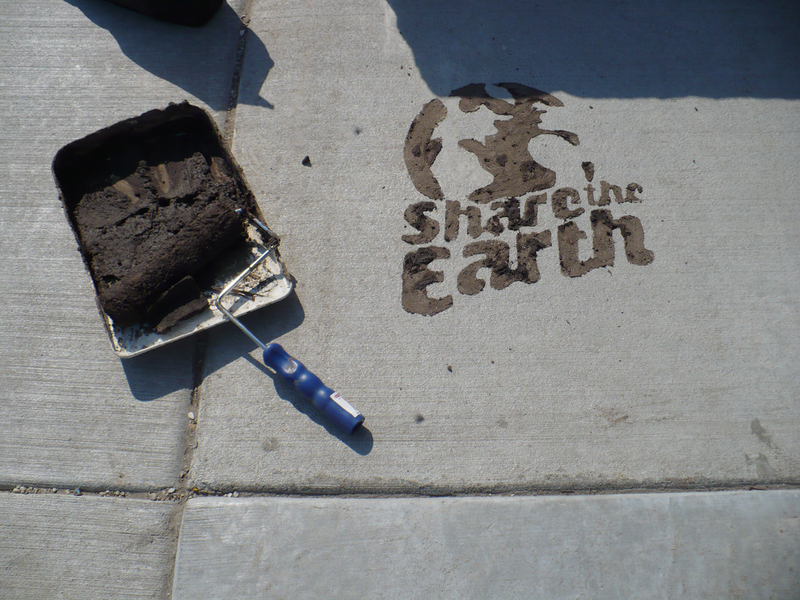 This morning, I learned about mud stencils (from Kirk Roberts via the Kernspiracy mailing list) which could be a very unique, eco-friendly way to spread your marketing message. The darkness of the mud feels like black spray paint, and offers more opportunities for high-contrast, eye-catching messaging than sidewalk chalk. Chalk messages were really big on my college campus … I’m curious to see if mud stencils catch on. Once Chicago thaws out in the spring, I’m really curious to try out this new technique. It’s pretty straightforward: all you need is a stencil cut out of mylar (the same material used for overhead transparency sheets), a sponge or roller, some tape, a bucket, dirt, and water. Draw your design (or print it out) and place a piece of mylar over it. Using an X-acto knife, cut out your stencil. Mix up your batch of mud until it has the consistency of peanut butter (if it is too runny, your design will bleed). Tape your stencil to a sidewalk or wall and apply the mud using a sponge or roller. Remove the stencil… bam. Marketing with mud. Would you consider commissioning mud stencils for your next project?